RICF believes that the best option for an abandoned or orphaned child is often with a relative. RICF has been involved in reuniting families where the reason for the child's abandonment has been poverty or homelessness. Where there is a mother or other relative who has a deep attachment to the child, this is a special relationship which can rarely be recreated with a substitute family. A real life example of family reunification - Ionut's story (short video with English subtitles). 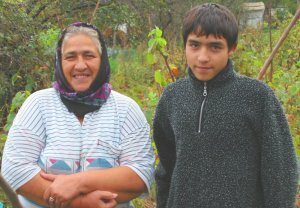 When this young man was 11, he was brought to RICF, because his mother was homeless and couldn’t look after him. A special donation was used in summer 2004 to purchase a house where they have been living together since. He went to the village school, where he made friends, and was in the football team. To start them on the journey towards financial independence, RICF’s social workers helped them access the state benefits to which they were entitled. For children who have not had a relative willing or able to look after them, RICF's foster care project 'A Family for me' has been instrumental in helping them also experience family life.